We bought a vintage clawfoot bathtub. It seems like a ridiculous thing to announce to the world, but oh, she's a beauty! 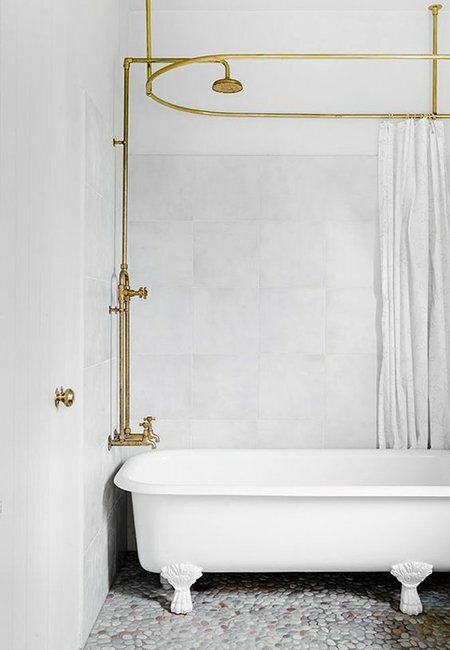 With gorgeous, antique feet, sparkling, brass fixtures and even a vintage shelf – I'm already envisioning the relaxing baths I will enjoy in our new master bathroom. So far, we have only been buying building materials, so please excuse my excitement over a bathtub. 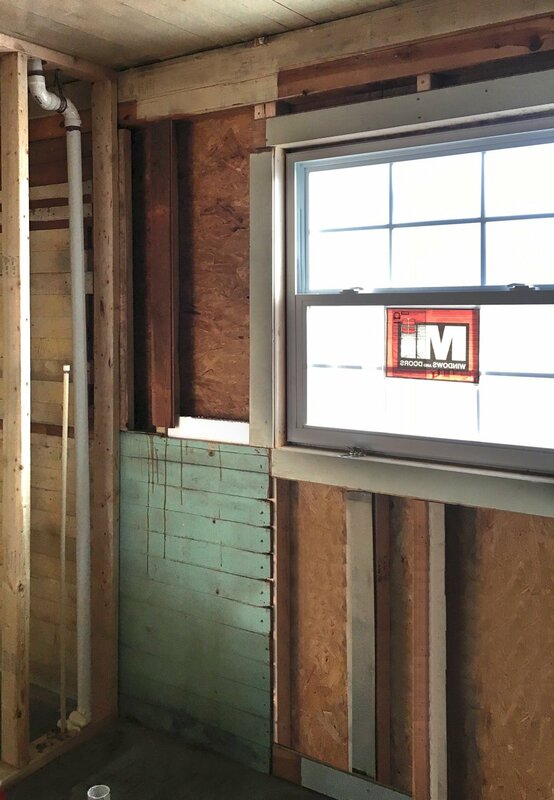 Although we are now entering quite possibly the most expensive stage of remodeling, when the hundreds – if not thousands – of home details like lighting fixtures, appliances, furniture, tile, etc. are quickly adding up to panic-inducing figures, there is just something oh-so-special about purchasing the first official item that makes the entire process (and the light at the end of the tunnel) very real. 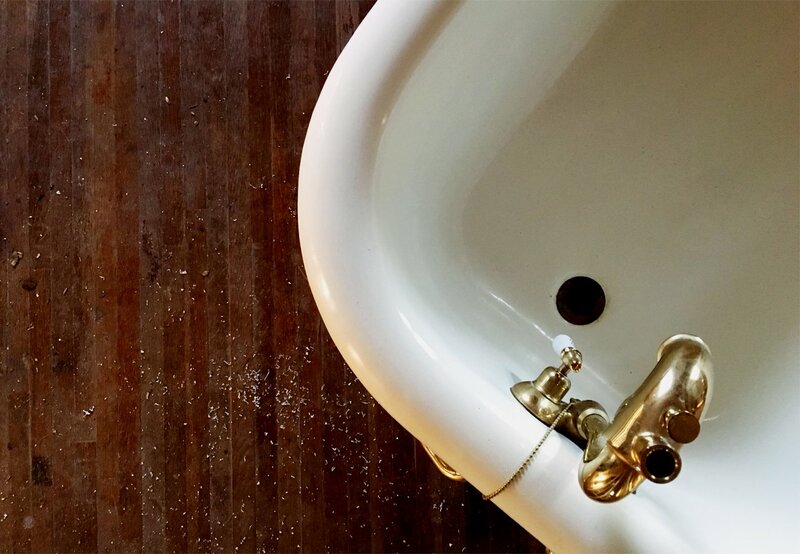 In light of the vintage clawfoot tub excitement, which, by the way, still needs to be cleaned and polished, I've compiled a roundup of inspirational ideas for the space. I can't wait to hear what you think of our plans! Despite the totally different decorating styles, there are a few key themes across these photos. 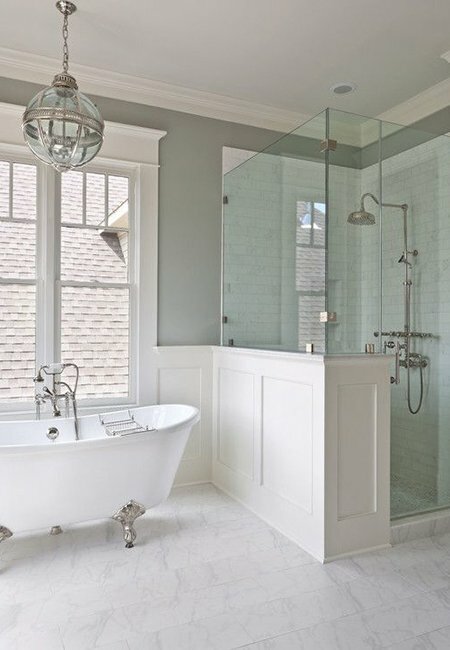 I've chosen a light color palette of whites and grays, punctuated by the brass hardware and faucets. It'll be a challenge to decorate in a way that combines glam and modern details, but if these photos are any indication, it can definitely be done. 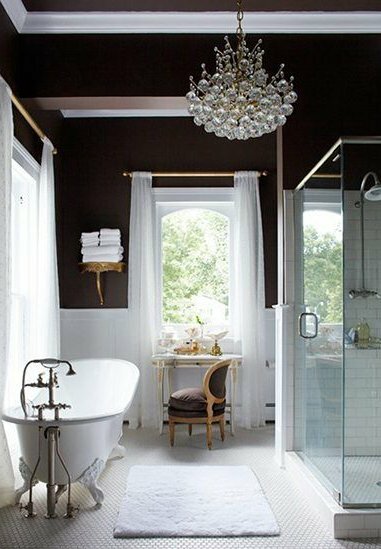 I'm planning to hang an elaborate chandelier over the bathtub but haven't yet figured out what to do with the window behind the tub. 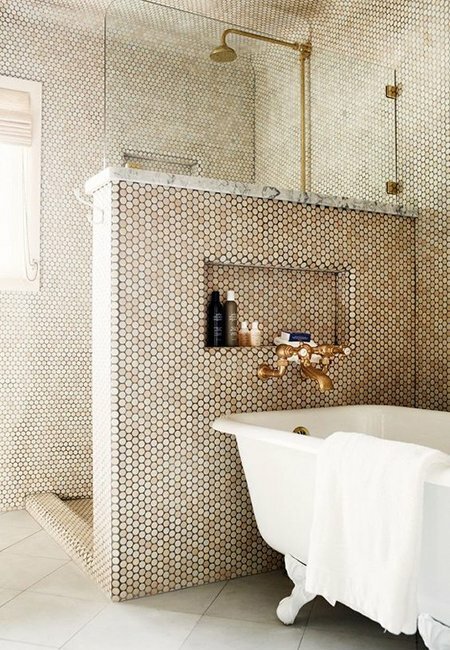 If our budget will allow, I would also like to tile the wall directly behind the tub to showcase the statement piece even more. 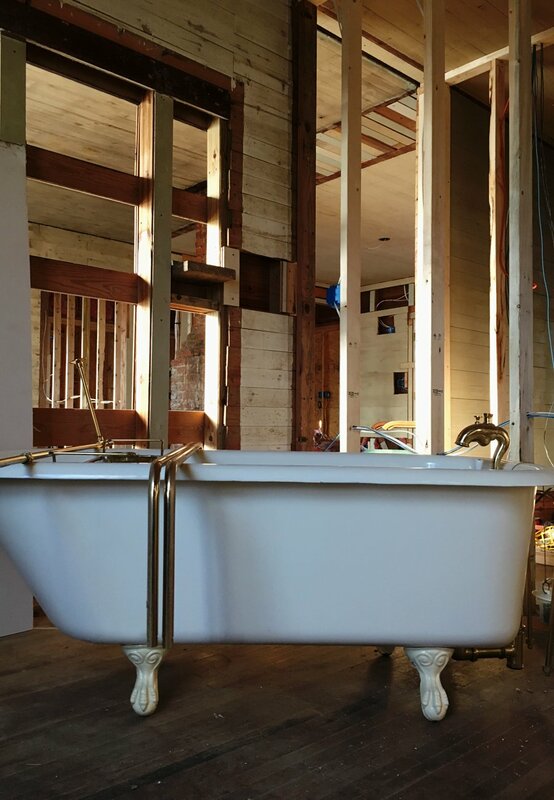 What do you think of my plans for the vintage clawfoot tub? Do you have any suggestions for mixing vintage and modern styles without overwhelming the 100 square foot space? And what should I do with this window – blinds, curtains or neither? Love the eye-candy that you posted along with your article! 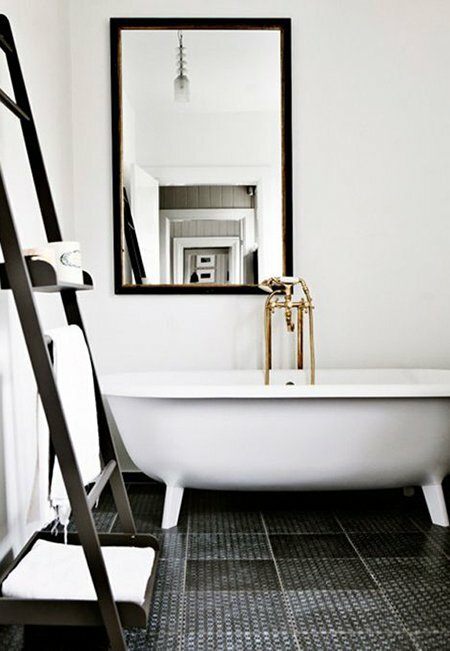 Clawfoot tubs are beautiful in every setting. 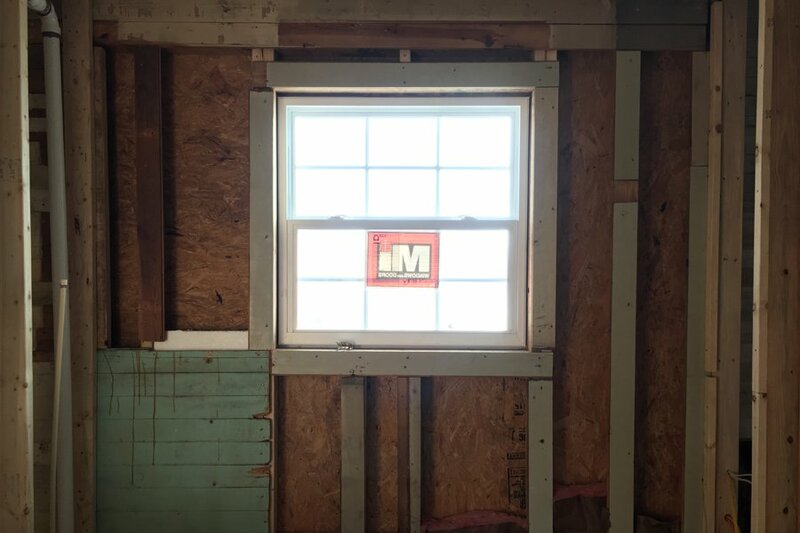 For the bathroom window, natural light is best. A white pillow slip or doily which is repurposed as a curtain is lovely. Keeping it simple is so appealing. 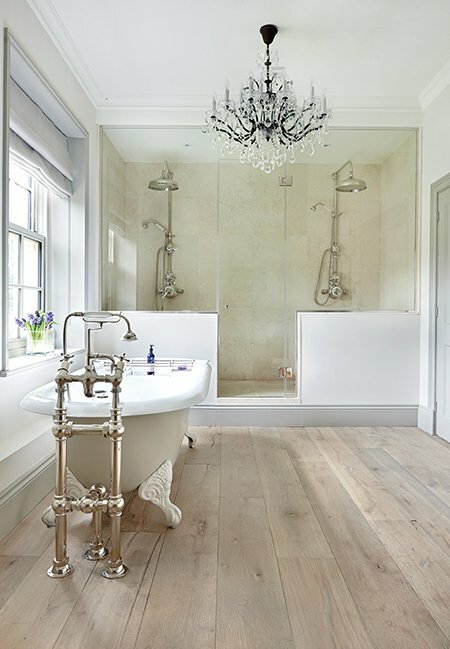 I love natural light pouring into bathroom spaces (really any home space). Therefore, I abhor anything that cancels that out during the daylight hours. The dilemma always proves in how to provide privacy when needed. My new love is simple window frosting for the lower half of double hung windows. Where absolute privacy or (nighttime) light blocking is required I love coupling it with simple substantial curtain panels that add a layer of texture &/or color to a room. However, those curtains must stack back past the absolute window edges to allow all that wonderful daylight in. In your tub nook, I’d be tempted to treat that window with the lower half frosted. Then layer a full wall width rod with sumptuous open weave linen type curtain either hung from clip rings or grommets. More substantial than a true sheer. Yet allows the lightness to prevail with all the light tile work. Romantic, textural and a bit more contemporary leaning to balance things out. 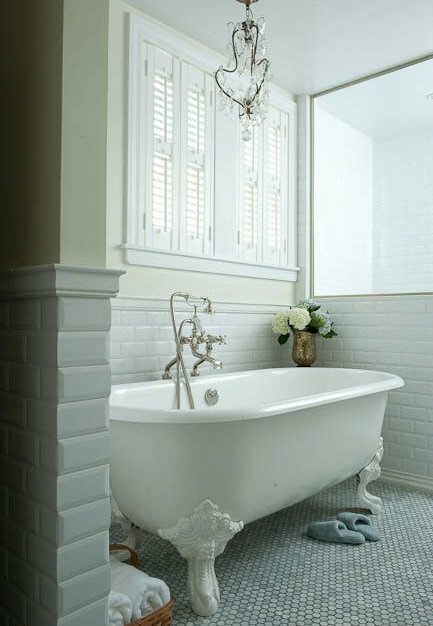 clawfoot tubs are classic and gorgeous! so exciting! How exciting! That is one of my dreams when I have a house of my own. Please keep us updated on the progress!! I’m in love with claw foot bath tubs!! I must have one once I finally get a house of my own. I’m so jealous, definitely keep posting about the remodel, I would love to hear how it turns out! Your life will be forever changed once you take your first bath. I have a claw foot tub and I don’t think I could ever go back to a regular tub! It’s not ridiculous to share! I love claw foot tubs! The ones you posted are gorgeous. I am determined to have an old school bath tub when I have a house of my own! 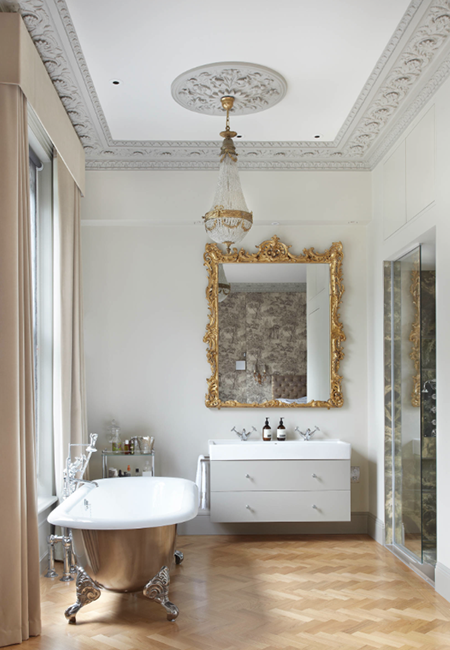 Clawfoot tubs look so elegant in any bathroom. I’d love to one day design a bathroom like you are and add this as a focal piece.